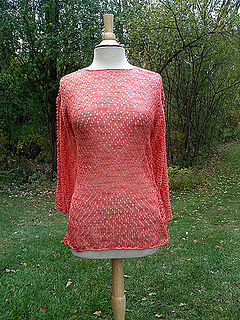 35 (37, 39, 41)", size small shown 35"
This beautiful lace pullover is a breath of fresh air; wear it for a splash of color with white linen pants and a white cami. Or, slip it over a sun dress after the sun goes down. 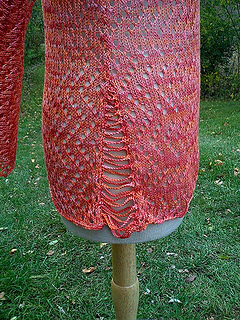 Deceptively simple, the lace stitch pattern is worked even (no increases or decreases) and the garment’s shaping is made with super simple crochet chains for the side vents and along the sleeve and shoulder seams. 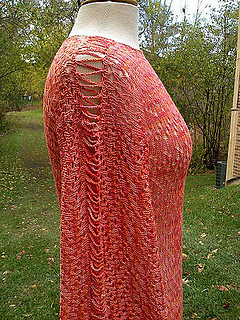 The pattern includes both line-by-line instructions and a chart for the lace stitch pattern. A schematic is included for all 4 sizes.